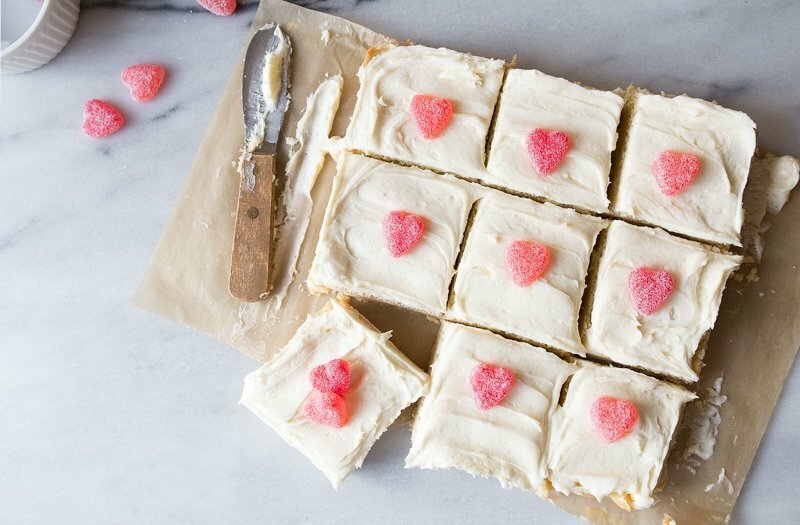 Sugar cookie bars, small recipe made in a 8×8 square pan. What would you do if you were in a grocery store and overheard a woman asking where the cream cheese is, and as she picked up a tub of whipped cream cheese, she then explained that she was planning on making a cheesecake? Would you chime in to say that whipped cream cheese isn’t the best for making a cheesecake? Could you stand beside her and grab a regular cream cheese block, and hope that she notices it? Or, would you circle the store while you tried to decide what to do? Am I the only weird one who is upset by this? I understand why she finds it confusing–it’s more common to see a tub of whipped cream cheese. It’s in the fridge at work, and it’s what you see at the bagel shop. 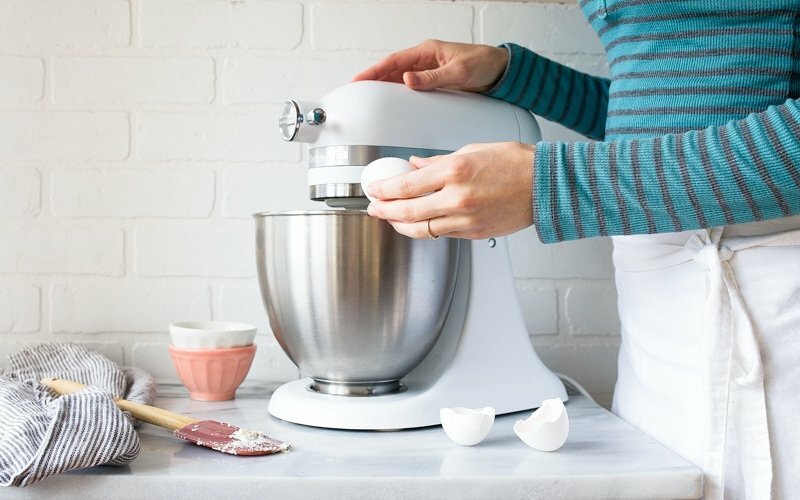 Can we talk about the new KitchenAid Artisan® Mini Stand Mixer? It’s perfect for Dessert for Two recipes! 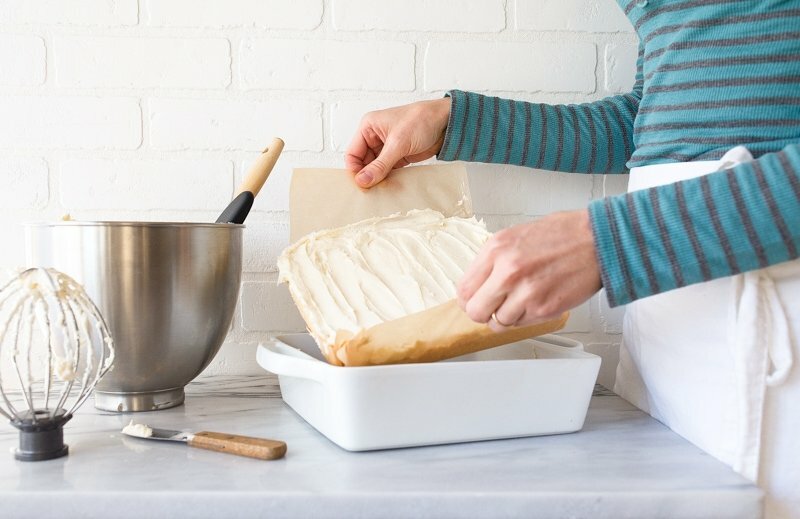 I’ve wondered how her cheesecake turned out more than a few times over the past few days, and decided the only way I could apologize to her was to make her a dessert that used whipped cream cheese, like these sugar cookie bars with whipped cream cheese frosting. There’s a super small chance she reads this site, right? I just hope she isn’t so discouraged by her cheesecake flop that she gives up baking altogether. My wish is that she somehow knows there’s hope left for her baking skills. (In the meantime, I hope she checks out my cheesecake recipes). 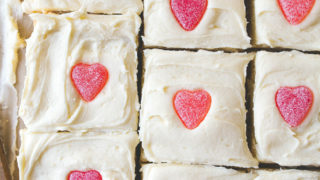 I even made her a little how-to video for these sugar cookie bars so that she has guaranteed success with this recipe! Okay, now I’m just sounding obsessive. We should talk more about you. Are you mad I’m sharing Valentine’s Day recipes right now? Are you sipping a green smoothie and craving a super thick sugar cookie piled high with cream cheese frosting now? I’m sorry about this. It’s just that I have so many dessert for two recipes to share with you, that I have to start sharing them now so we don’t run out of time. Valentine’s Day is just 6 weeks away! Valentine’s Day also happens to be the official release date of my next cookbook: Sweet and Simple: Desserts for Two! We have a lot of things planned in the next few weeks, so get ready! When I wrote my first book, Dessert for Two, I had to include a note about not using a stand mixer to make my recipes, because stand-mixers are much too large…the beaters would spin without touching the small amount of batter at the bottom of the bowl. However, that was before KitchenAid came out with their new Artisan® Mini Stand Mixer! The bowl is just 3.5 quarts, and it’s perfect for making small batches of dessert. It’s basically my dream, and I feel like it is made just for me! Well, me and the woman at the store who tries to make cheesecake with whipped cream cheese. 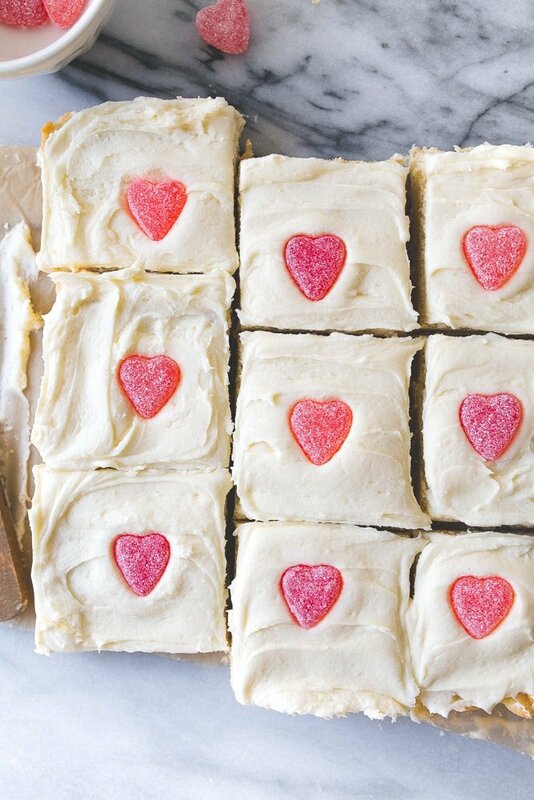 Best ever sugar cookie bars with whipped cream cheese frosting. For that lady at the supermarket. Preheat the oven to 350, and line a 8x8" pan one-way with parchment paper. 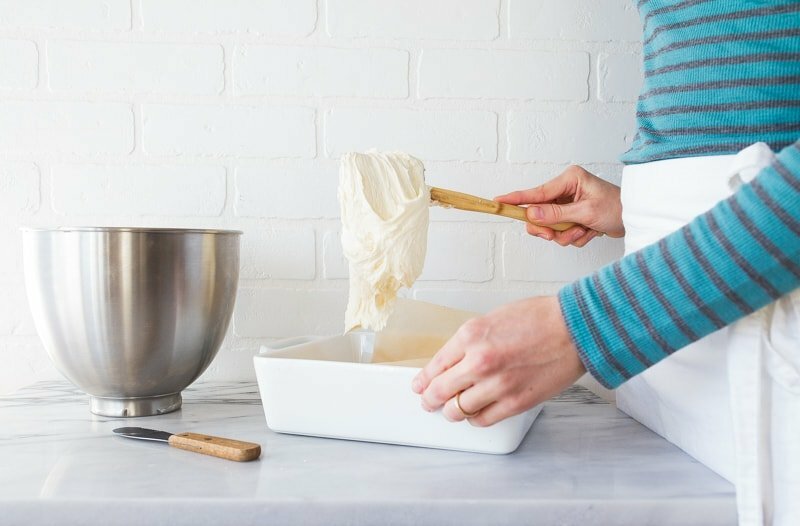 In the bowl of a mini stand mixer fitted with the paddle attachment, make the cookies: add the softened butter and beat on medium-high speed for about 30 seconds, to fluff it up. Slowly pour in the granulated sugar while continuing to beat. Next, add the egg and vanilla extract, and beat to combine. Turn off the stand mixer, and sprinkle the flour, baking powder and salt evenly on top. Turn the mixer back on LOW and beat to incorporate the dry ingredients. Scoop the batter into the baking pan, and press it flat with your fingers. Bake for 20 minutes, or until a toothpick inserted comes out mostly clean with only a few crumbs. Let cool completely. 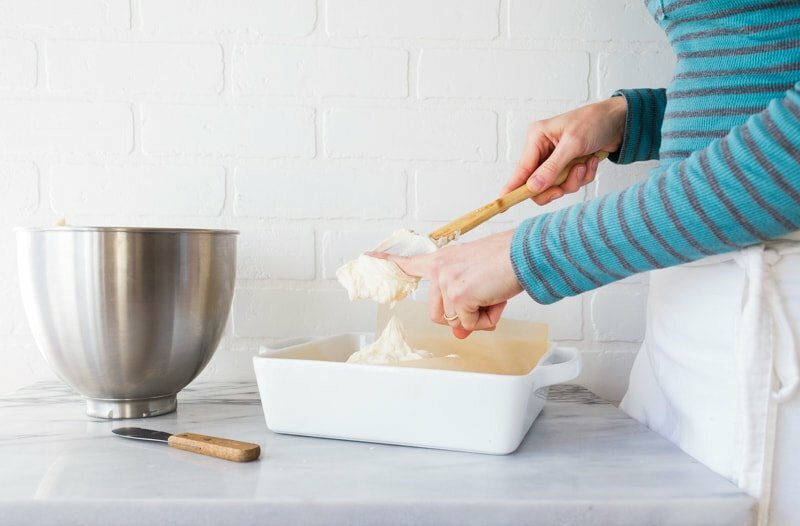 In a clean mini stand mixer bowl, make the frosting: beat together the softened butter and cream cheese for 1 minute, until fluffy. Add the vanilla and beat to combine. Turn the mixer to low and add the powdered sugar one-half cup at a time while continuing to mix. Add a splash of milk if you think it needs to be thinner. Spread the frosting over the cooled cookie, decorate with candy, and then slice to serve. i hope she is reading this and will be heading back to the store for real cream cheese. im torn between smoothie based recipes and all things valentines. Love this recipe!! Can’t wait to make it. I think it would be lovely using strawberry whipped cream cheese. And about the lady in the store, next time speak up! :) I’m 50 and I have spoken up in the store lots of times. In all those times I’ve not once met anyone who was upset. Sometimes I even exchange emails and, out of those times, 4 of those people have become friends. ;) Once you do it, it will get easier. Can’t wait to see what you do in 2017! Blessings! You’re right, Janine! I normally do (I love talking to strangers), but I didn’t want to come off like I was a cheesecake expert. Baking intimidates so many people, you know? But you’re right, I should have said something! And great idea on the strawberry cream cheese!! I’ve made cheese cake with whipped cream cheese. Came out fine. Thinking of that poor woman and her cheesecake. We can only hope that someday she will learn! These, on the other hand, look like pure perfection. I MUST try these soon! My favorite is when a friend asks what happened to their cookies when they’ve used a “spread’ in place of butter. I have the cookie part in the oven right now. A girl has to do what a girl has to do when we have snow arriving in South Carolina late tomorrow. Smells like heaven coming from my oven. Update to my morning post! Iced the cookies and they are beyond yum. Thank you Christina. I will be making a few times.???? I’ve had someone help me in a store before because she overheard me trying to ask my dad about something on the phone. I was extremely grateful. Next time ???? As for the mixing, what if you have a hand mixer with no paddle attachment? Assuming this would still work okay? Love that this recipe makes a small amount. My most recent experience in the grocery store was watching a clerk help a gentleman to look for dry mustard for his wife. The clerk found ground mustard and the man seemed skeptical that it was right. I offered to Google to reassure him that ground was the same as dry. I could only be amused that perhaps on previous shopping trips he brought home the wrong ingredient and caught heck for it. Lol. Maybe next time, Christina, you could ask someone like her to tell you about the recipe because you were curious and would love to find a “new” way to make cheesecake. Then if it’s a traditional recipe you could offer that block cream cheese is what is used. I think that could come across as helpful and not offensive. Thank you for this recipe. Gonna hold onto it until Valentine’s. Yum! Just finished a piece of your mini chocolate cake right down to the pomegranate seeds. Another winner! Are these bars soft or crunchy? My husband told me late one night that he needed to bring sausage balls to work the next day. I sent him to the store for the 3 ingredients–grape jelly, chili sauce, n little sausages. He came home with grape jam, ketchup, and breakfast sausage patties! Can you tell me how to adjUst this for high altitude? Is there any reason I can’t double this recipe? Is there any reason this cannot be doubled? I need a larger amount for a group… these look delicious! Do I need to refrigerate these because the frosting has cream cheese in it? I just made these & they are SO yummy! I love, LOVE, LOVE your recipes! Do you think you could sub coconut sugar for the granulated sugar in the cookie? I’m just thinking of how good your coconut sugar cookie recipe was and wondering if I could recreate it in these delicious looks bars! Can you double this recipe and bake in a 9×13 pan? If so how long you think? Thanks! I think so. I would add an additional 5 minutes to the baking time, and keep checking it every 5 minutes. I’ve never doubled this recipe, so I’m not entirely sure though! The video pictures the “whip” and the recipe instructions state “paddle” attachment. Does it make a big difference? I’m eager to try with Halloween sprinkles! My daughter and I are making these for Valentine’s day! I have a 9×9 pan. Will that work ok or do I need to make any adjustments? Can’t wait to try these!! !